My back hurts, but the curve now has most of the ballast it needs glued down. The remainder will get added when the Lokstation is back where it's supposed to be and the transitions are scenicked. This time I tried a slightly different approach applying the glue in order to minimize movement of the ballast. First, I sprayed about a foot of track with 70% Isopropyl alcohol, to help with breaking surface tension of the glue. Then (and this is the change) I let the glue wick in from the sides of the track. Either by applying the glue right at the outside base of the track in locations where I didn't shape the ballast edge, or set the eye dropper on top of a tie end and carefully let the glue slowly wick into the surrounding ballast. Either way, the glue will wick under the track into the middle and wet the ballast from below, thus gluing it in place with almost no movement. When the ballast turns white from glue you know it's soaked all the way to the roadbed. Using this "bottom-up" approach I no longer get the "wash out" effect I regularly had to deal with when dribbling glue into the middle of the track from above, and all ballast starts to swim in a puddle of glue between the ties. 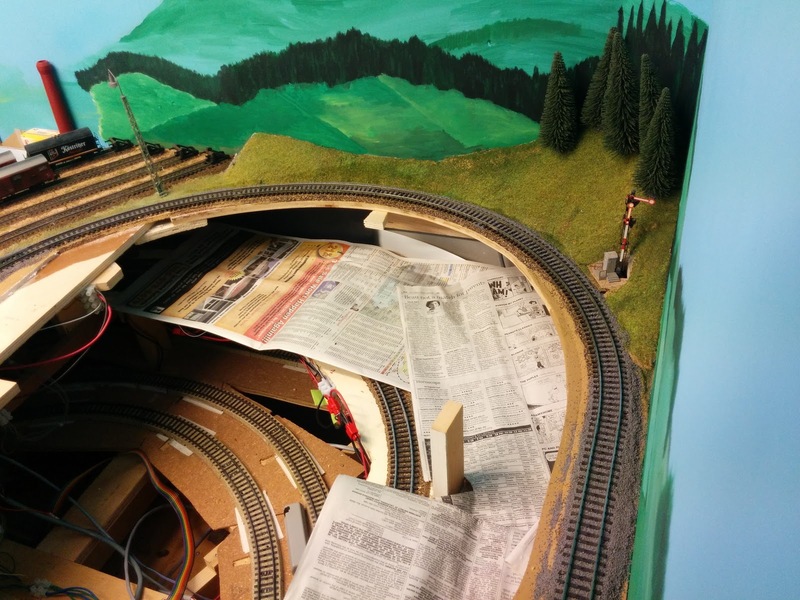 The center studs in Maerklin track make it very difficult to arrange the ballast evenly between the rails. This approach keeps the pieces where they are supposed to be and minimizes cleanup later.